It was an exciting and early morning for PS2G at the Homeless World Cup in Mexico City as we transitioned from facilitators to supporters in the tournament’s opening day. Watch the full video recap on Facebook. The morning began with a march through the historical district of Mexico City. The spectacle showcased the best of world football culture by displaying both national pride and international cooperation. Flags, signs, smiles, chants, and dances were in abundance as all tournament participants lit up the historical district. The parades’s final stretch was a circling of Zocalo, the Mexico City square hosting the tournament, before arriving at the stadium for the opening ceremony. We marched with the US in-front of the energized delegation from Zimbabwe, leading to several Zimbabwe-USA chants. As teams made their way into the stadium, teenage football freestylers who defied the laws of physics entertained the crowd. They were followed by traditional dance performers who gave the ceremony a local flavor, before several speakers addressed the crowd and highlighted the global uniting power of football. 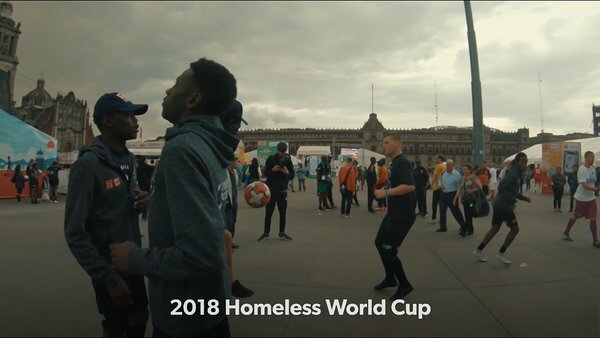 the founder of the Homeless World Cup Mel Young remarked that the heroes of the occasion are the players who have made impressive journeys to get here. He turned to the players to congratulate them on their achievements. Following the opening ceremony we headed to field 3 to support team USA. We got to cheer on the women's team, as they opened their tournament with an impressive victory over Paraguay. After going down a goal early the US took control of the game. The US stuck to their game plan. With organized team play and lethal finishing they cruised to a 7-3 victory. Natasha Mariam was incapable of missing on the day, ending the game with 4 goals. Mariam said of the game that “when you are focused you score.” Adding that she managed to block out the atmosphere and focus on the game. Later in the day the Women’s team faced off against England. With first game jitters gone the US looked confident from the beginning and with an all-around impressive performance cruised to a 8-5 victory against a quality English squad. Justine Grimmond bagged a hatrick, while her fellow Californian Tatiana Payton had an outstanding performance in goal. Immediately following the women's opening match we cheered on the Men as they took on a disciplined and aggressive Costa Rican side. In a cagey affair the US came close to tying the game with two late goals but ended up falling a goal short with 3 goals to Costa Rica’s 4. Omer Boush said after the game that it was the team’s first time playing together, and that as the game went on they grew as a unit. He added that he enjoyed the day, and is happy to grow closer with his teammates as well as players from other nations. “That’s more important than winning the trophy,” he added. Boush’s observation that the team was meshing was apparent in their second game. While the US fell short against Portugal their play in possession was vastly improved from the first game, with well spread out triangle passing defining the US play for much of the first half . A man of the match performance by Portugal’s keeper kept the US at one goal, while Portugal scored six. The score did not reflect the game play, with the US enjoying good spells and Portugal enjoying a few lucky bounces. This “real real world-cup” experience was made possible in part by your donations from signing up to play in our games! Find a local game here or donate via Givz.